One of the biggest changes in Suffolk in the twenty years I've lived here has been the influx of Londoners buying second homes, mainly along the coast. Twenty years ago, the East Anglian coast was deeply unfashionable, even to the extent that Michael Palin could make an amusing film, East of Ipswich, about how his parents had taken him on holiday each year to Southwold. These days, Southwold is rarely out of the colour supplements, and Aldeburgh and Walberswick are also full of weekend owners. All along the east coast the towns are falling to the power of Islington and Notting Hill wallets. Only unfashionable Felixstowe and Lowestoft look capable of holding out, and even then I expect that one day the London smart set will notice how charming Edwardian Felixstowe is, and how Lowestoft has the best beaches in the county. You might expect that Orford would have succumbed long ago, especially as it is so much smaller than its neighbours, but it seems to me that there is still a quiet resilience to the place, despite the way it is swamped with day visitors at any time of the year. Perhaps it is because it doesn't have a beach, or maybe that its houses are all rather too large to attract someone looking for a bolt hole. 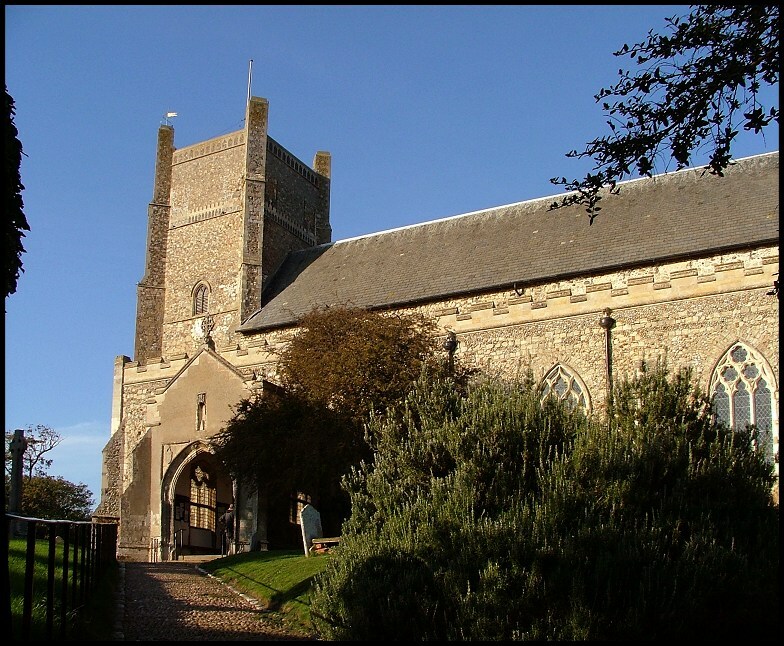 In 1978, Jean Carter and Stewart Bacon observed, in their fine little book 'Orford, Suffolk', that of all the places we have visited in Suffolk, and that excludes but a few, nowhere we have found a more typically Suffolk character than the true native of Orford. Orford isn't really a town at all; no more than a large village really, but it retains its services - a fire station, a school, three pubs - more by virtue of its wide, rural hinterland. But unlike Southwold, say, Orford does not turn its back on its fields and forests. The outskirts of the place have streets of former council houses, and the inhabitants are as likely to work the land as be weekend sailors. 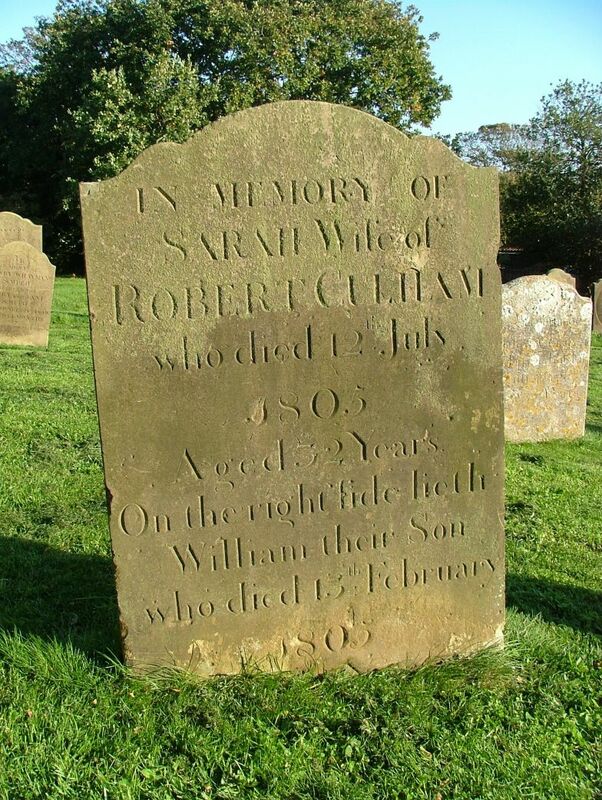 It is a reminder that Orford was originally a hamlet within the parish of Sudbourne. 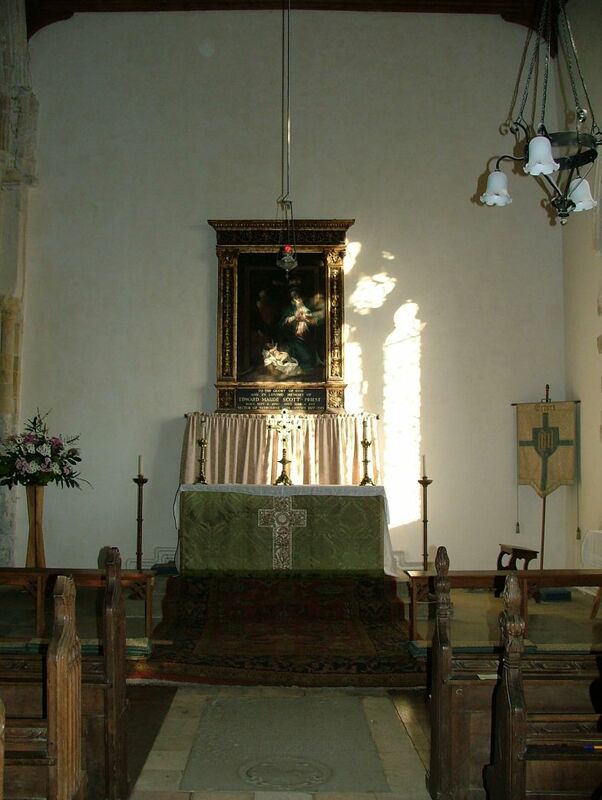 Indeed, St Bartholomew started life as a chapel of ease to Sudbourne church. Across the wide River Ore, which was the Alde before it turned suddenly south, the spit cuts Orford off from the grey North Sea, a dramatic thing to see from the top of Orford Castle, which can be the windiest place I know. 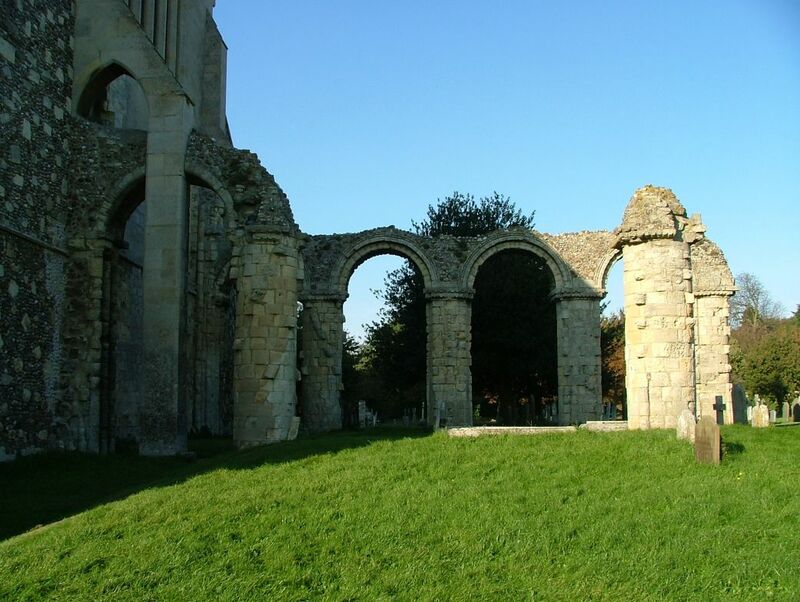 It was the building of the castle by Henry II that made a proper place of Orford, and led to the building of the church. Both castle and church survive, the market place between them, the Town Hall still fronting it. Despite the cars which line it in summer, and can make the walk down to the quayside a miserable one, the road between the church of St Bartholomew and the river is lined with houses as fine as any in rural England. Many are several hundred years old, most are large, almost all are red brick except for the odd manifestation of the 1930s modern movement which adds a piquance to the landscape of anywhere on the Suffolk coast. But anyone who has visited Orford will remember it most not for the pretty streets, or the sound of the wind, but for the smell. The Orford smokehouse is one of the reasons Suffolk appears so often in the colour supplements and the quality dailies, but in truth it is not an expensive place to buy food, certainly not in comparison with what you can spend on the high-food mile, non-organic, unfairly-traded rubbish that supermarkets sell. We live in the middle of Ipswich, but sometimes we make the journey just to go to the smokehouse, so it must be a real pleasure to be able to wander out of your house to pick up the kippers for breakfast. I have bought kippers in Cley, and Craster, and Arbroath, and all up the east coast of Britain. But none can compete with an Orford smokehouse kipper. St Bartholomew has a large, almost urban presence at the top of the village street. The first sight is of the tower top, a not entirely happy 1970s attempt at Suffolk Perpendicular to replace what had fallen in the 1830s. 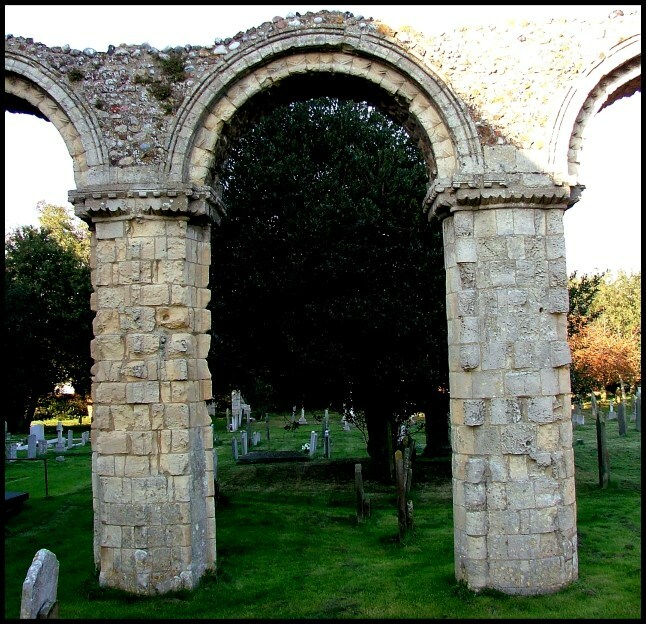 It doesn't promise much, but rather more exciting are the ruins to the east of the church. They are Norman, the best of their age in the county. 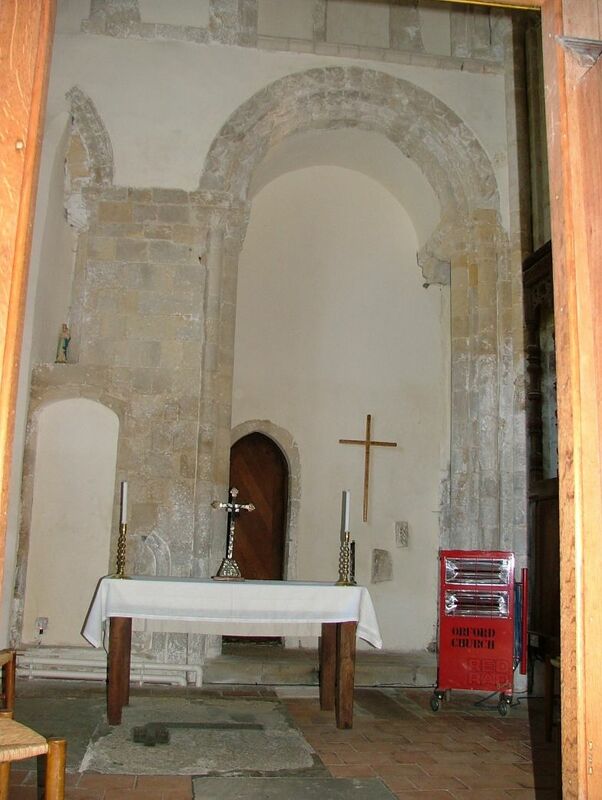 This was the chancel, six bays long with aisles on each side, the only original part of the Norman church surviving. 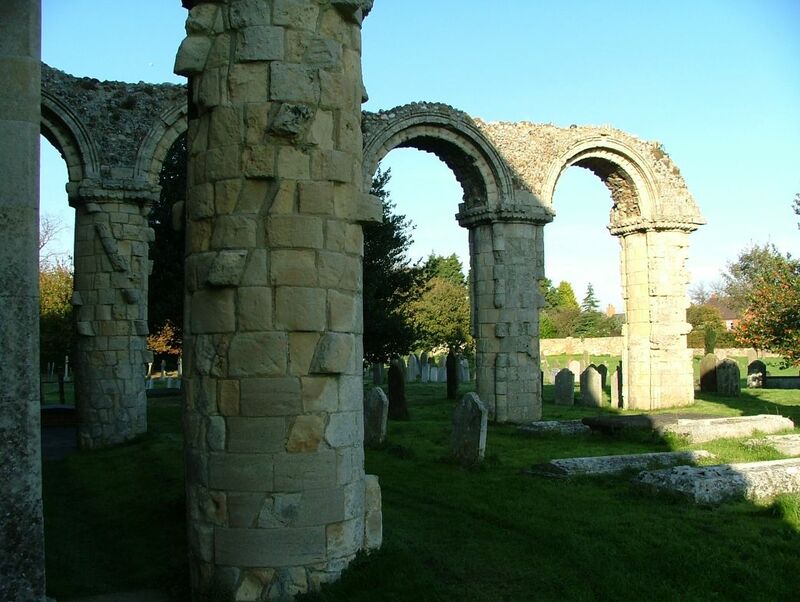 They suggest that the Normans thought of Orford as an important place. Again, the external east wall might suggest an over-restored and anonymous urban church, but the south side of the graveyard is pleasantly rolling with a scattering of fine 18th century gravestones, and the porch is enormous. You step into a large, wide, light space, for this church is always open every day. The most striking thing about the interior is that it is square. The wide aisles, and the loss of the chancel, and the high clerestory, give it a feel of a great hall as much as of a medieval church. 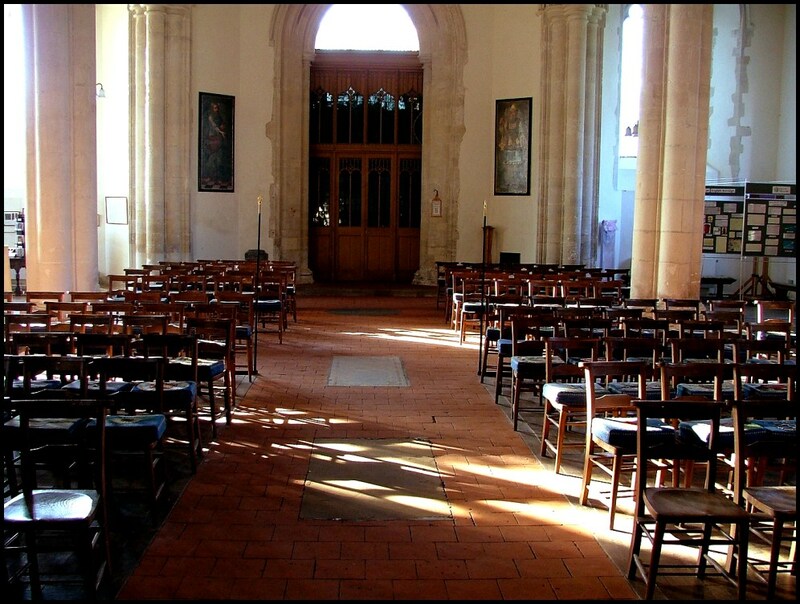 The Victorian furnishings have been removed, and the old stone of the floor is wide and clear apart from a grouping of modern chairs, always a good sight to see in a medieval space. 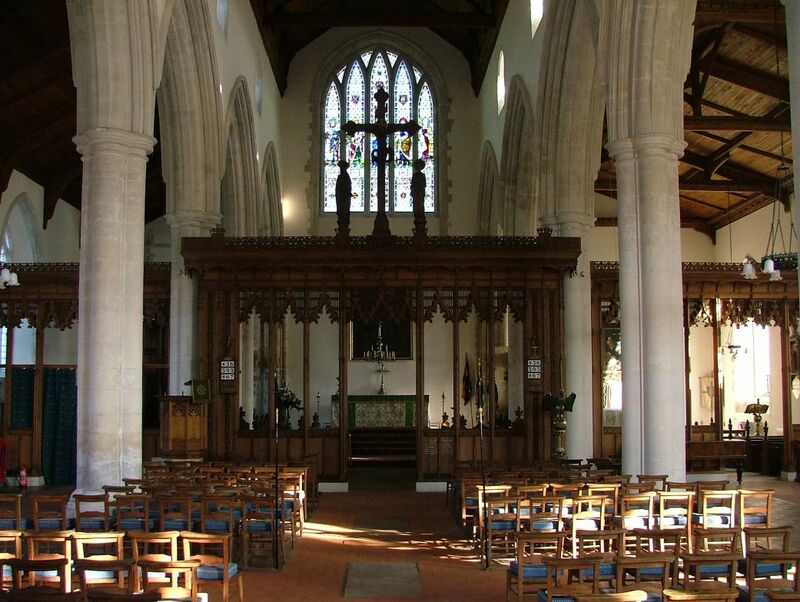 You can see straight away that St Bartholomew is beautiful inside, but it is also a church of outstanding interest. Of the first rank is one of East Anglia's most fascinating fonts, with two panels found rarely anywhere else in the region. One depicts a Holy Trinity, God the Father shown as an old man holding God the Son on a cross between his knees. 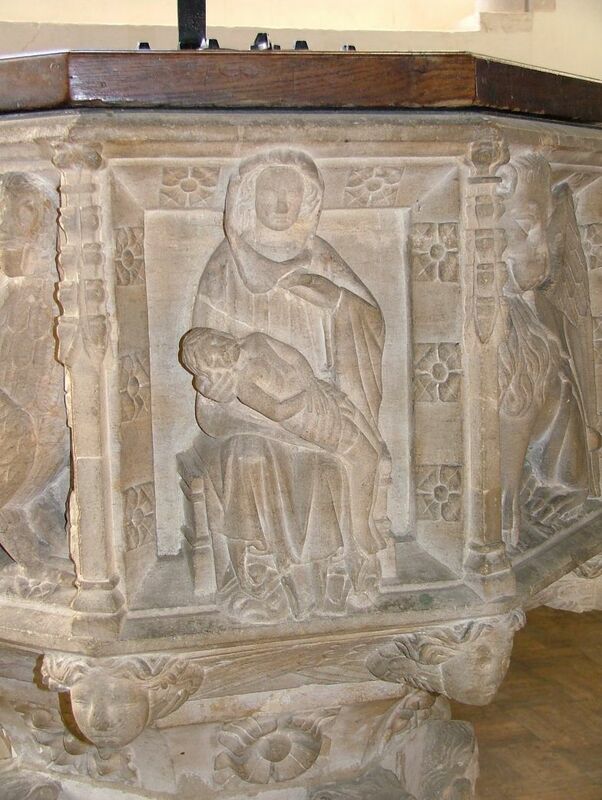 Even rarer, on the other side of the font is a pieta, the weeping Mother of God holding the broken body of her son in a detail of the Deposition from the Cross. These are not only interesting and important, but also profoundly beautiful. 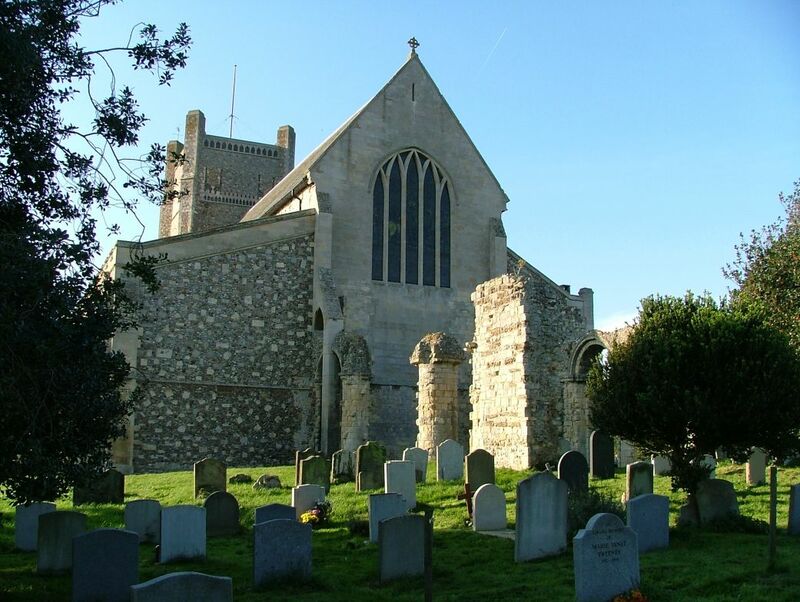 One of the modern names associated with Orford church is that of the composer Benjamin Britten. 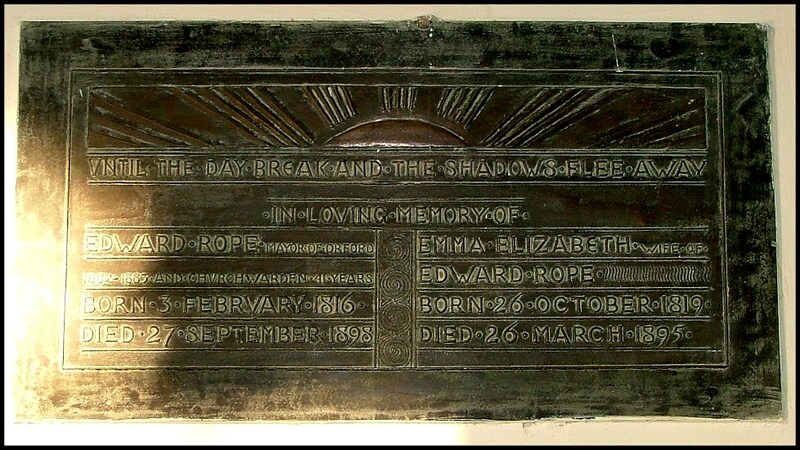 Born in Lowestoft,he lived at Aldeburgh and is buried there. But he loved this church, and used it for the first performances of his church parables, Curlew River, The Burning Fiery Furnace, and The Prodigal Son. Most famously of all, he used it for for Noyes Fludde, his version of the Chester mystery play about the Noah myth, which was originally performed by vast ranks of Suffolk schoolchildren. The recording of this first performance is still the standard version of the work today. There is no doubt that the shape, space and light of this church informed the structure and scale of the works designed to be performed here. He is remembered by a large roundel in the middle of the nave, and a sculpture depicting Noah's release of the dove in Noye's Fludde. 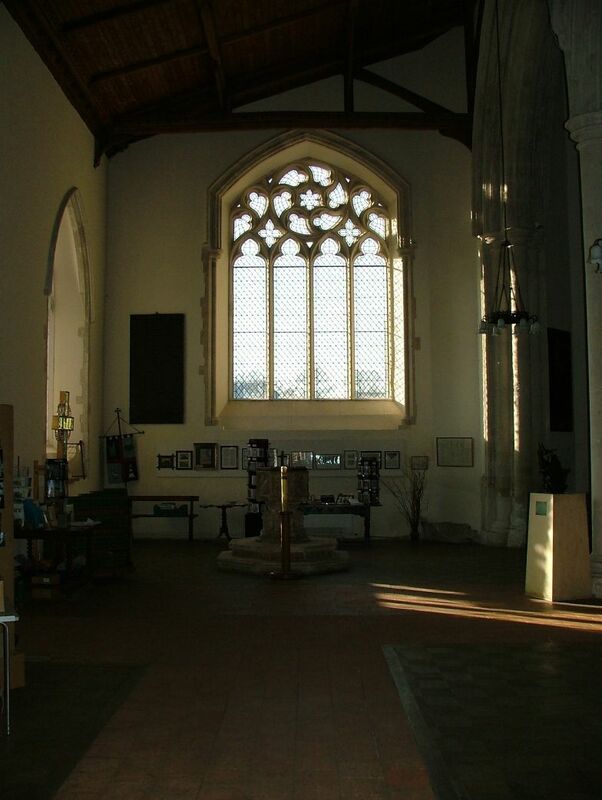 High in the west window beyond it is an echoing roundel of glass depicting the Orford Arms. The view west is rather better than the view east, because of an enormous, heavy 19th century screen that blocks off the two most easterly bays of the arcades. 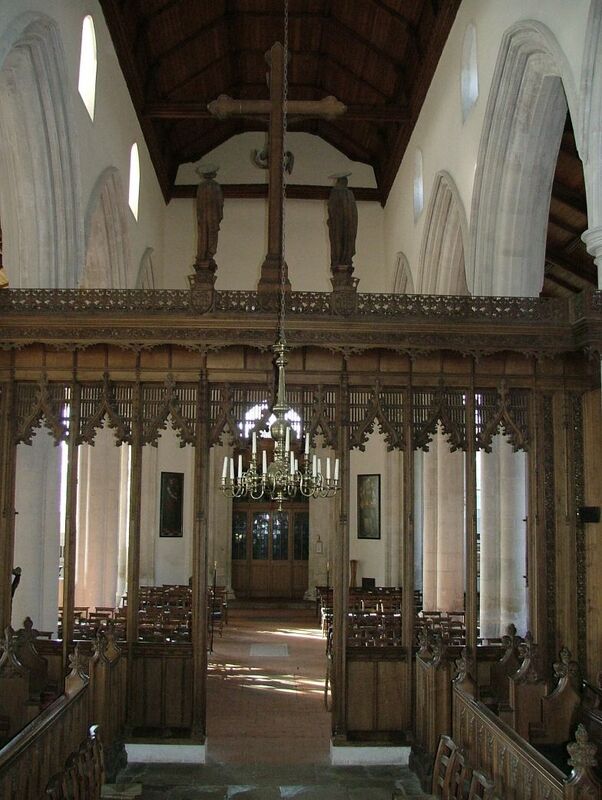 It creates a kind of proto-chancel containing heavy choir stalls, and it is tempting to wish it away so that the whole interior might be fully open. It does much to detract from a magnificent, high east window of 1920 by Clayton and Bell depicting Saints in a high church manner, and to step through it is to enter a part of the church with a quite different feel; labyrinthine, cluttered and secretive. 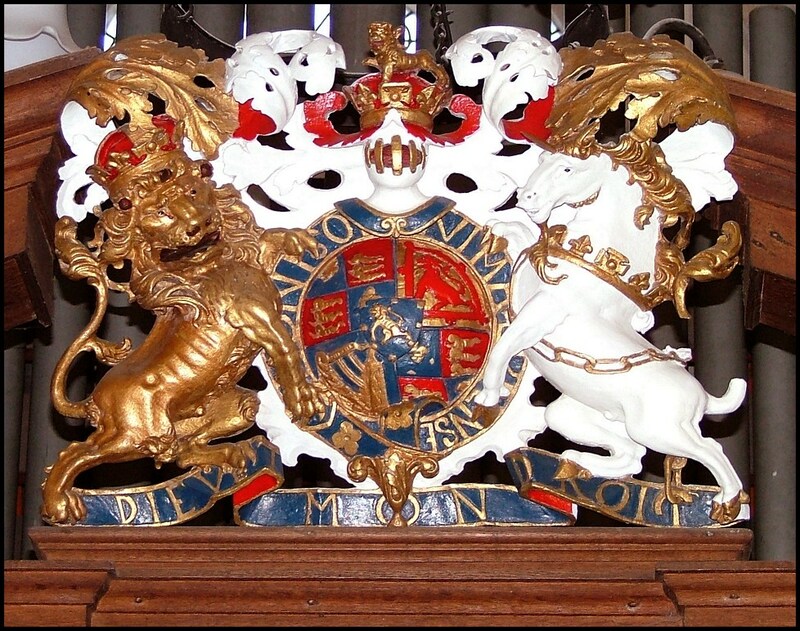 A fine organ screen is painted with its donor's name, and surmounted by a painted wrought iron royal arms of the House of Hanover. 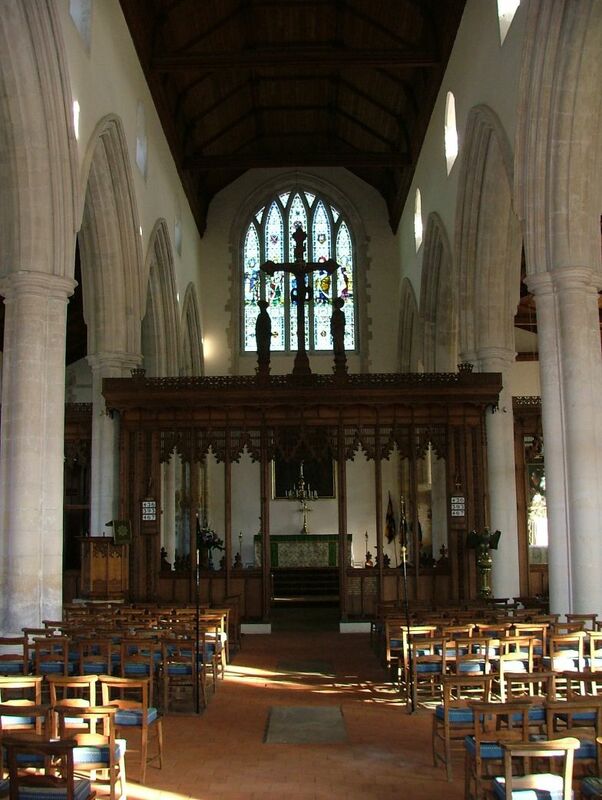 The organ creates a narrow way into the south aisle, and generally the feeling at this end of the church is of a series of interconnected rooms. 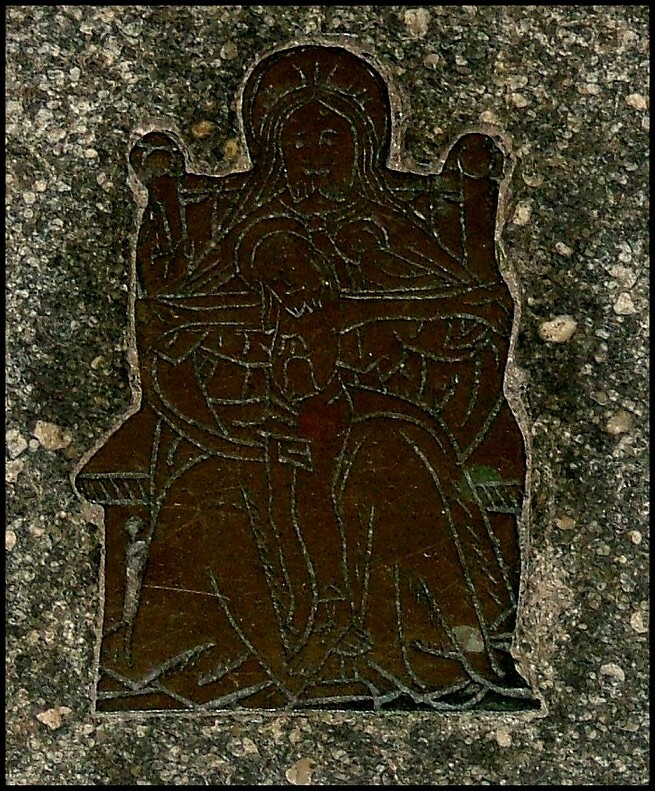 Here you'll find one of the best collections of brass figures in East Anglia, not clustered together, but scattered and obscured, a rich ground for exploration. Some have been reset from elsewhere in the church. 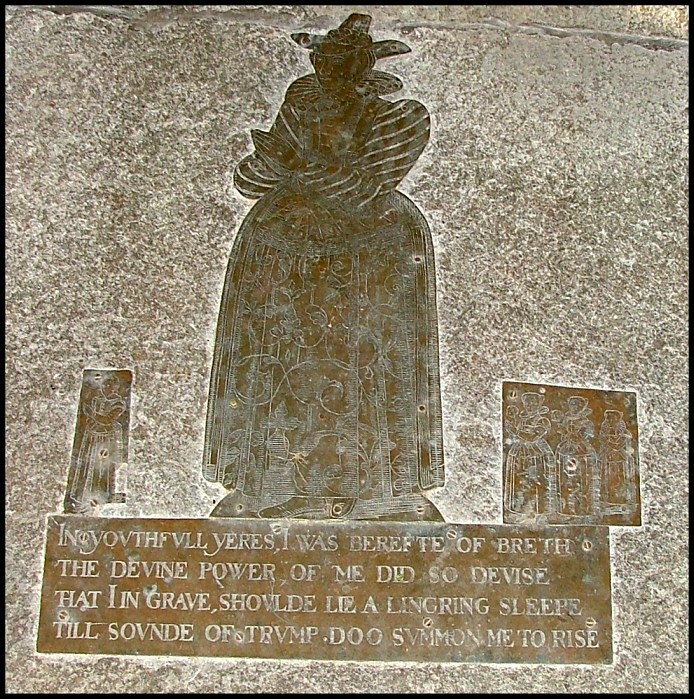 Most are from the late 15th and early 16th centuries, but although the figures have survived the inscriptions have mostly not, destroyed by the puritans in 1644 because of the Catholic prayer clauses which had survived the arrival of the protestant Church of England. 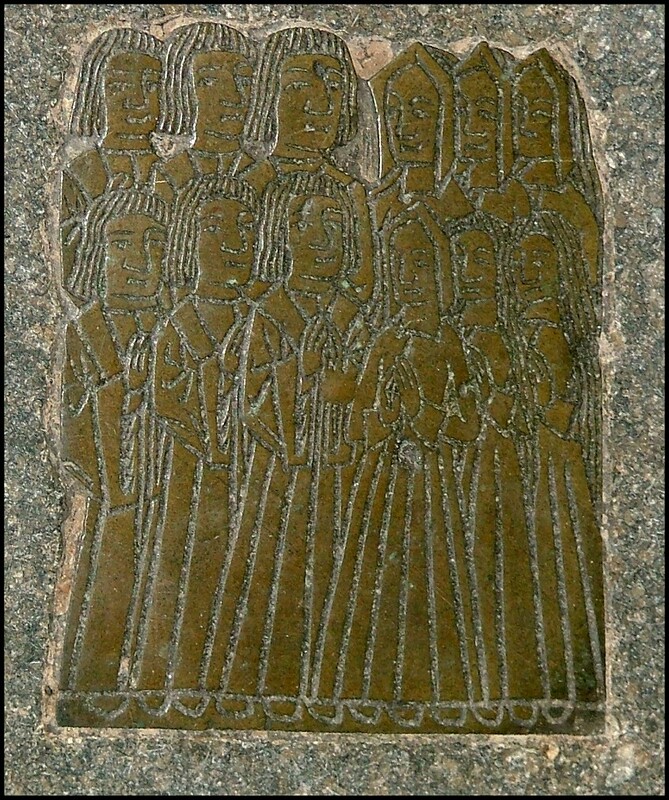 Inevitably this means that we don't know who many of them were, although some are members of the Coe family who provided early mayors of Orford. 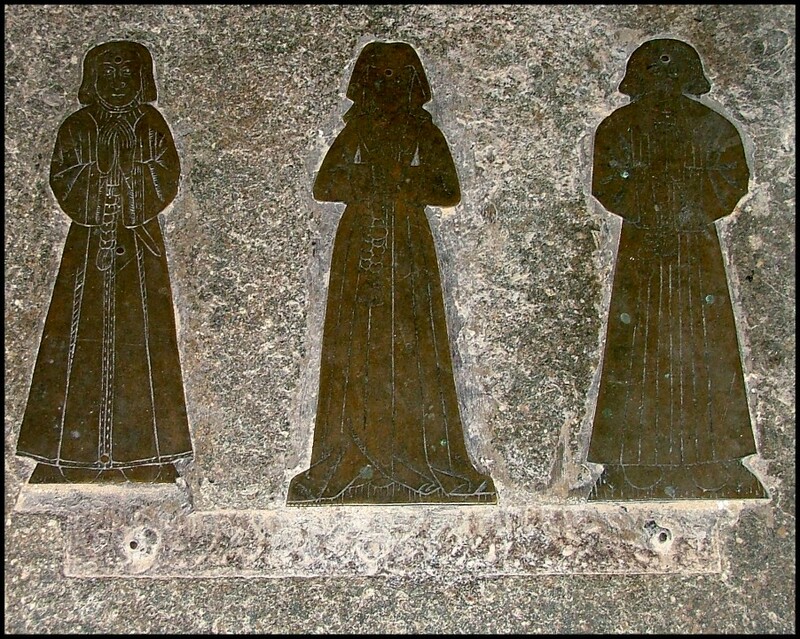 In return, early 17th century Orford Puritans have left some fine brasses of their own. Most precious of all is another Holy Trinity scene, similar to that on the font but more primitive and mysterious. Did it come from here originally? If so, how did the Anglicans and Puritans of the 16th and 17th century miss it? 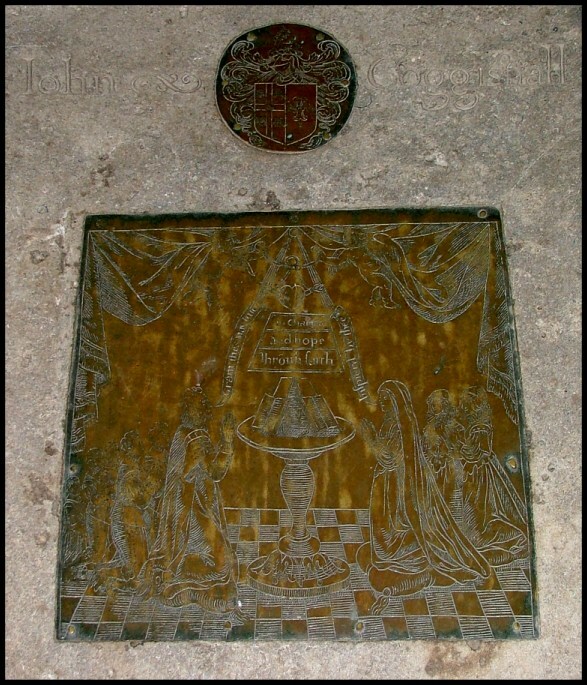 The font must have been plastered over, but it is harder to disguise a brass. 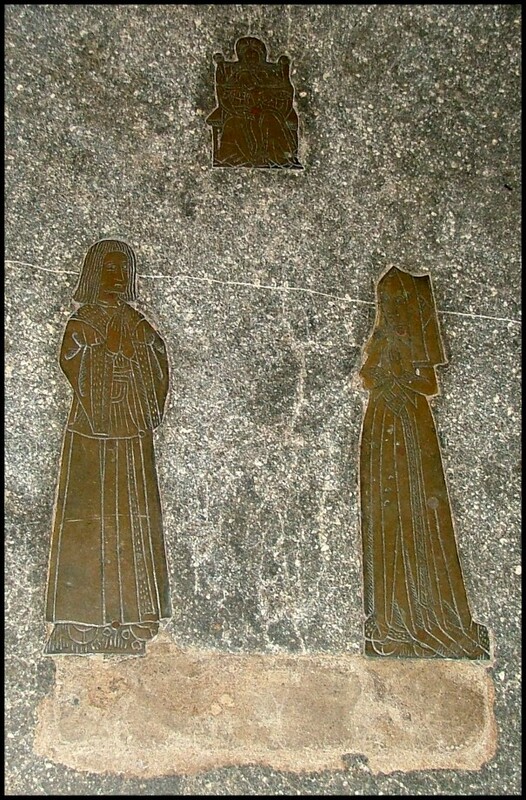 These things are such rare survivals that it must be more than mere coincidence that they are found here together in the same church. This beautiful church has thousands of visitors every year, almost all of whom must be seduced by its beauty. But it repays an hour or so spent in its shadows and light, its dark corners and its open places. 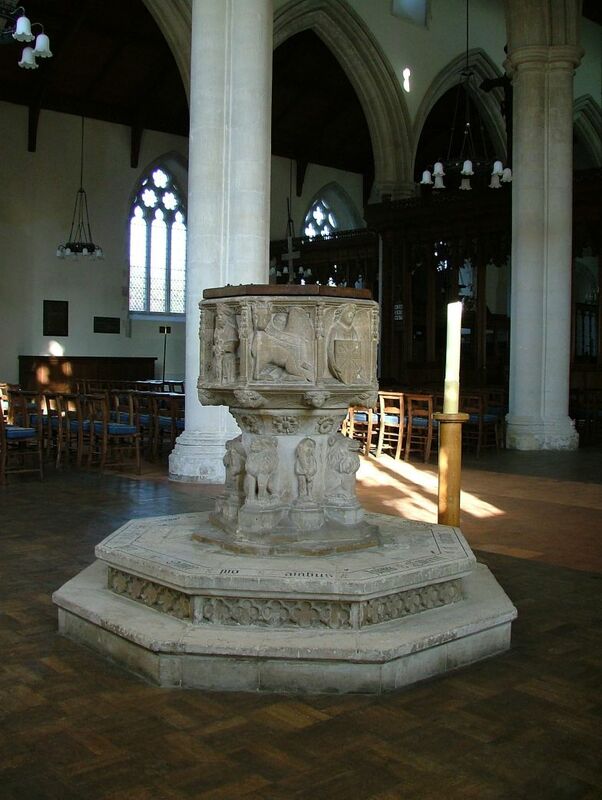 It is one of those churches where there is always something new to discover. One impression you may take away is that Orford was once a more important place than it is today, and although it has never been a big place, your impression would be correct. The town was a classic example of a Rotten Borough, with an elected mayor and corporation. As late as the Reform Act of 1832, Orford had just 246 houses, but returned two MPs to Westminster to represent just 22 voters. Walking the streets today, it is hard to summon up the bustle of an 18th century election, or any kind of bustle really. Come in winter to avoid the daytrippers, when the air is fogged with smoke and the mist from the sea, wrapping the red brick houses in a secretive velvet. Don't miss the outhouse full of secondhand books in aid of Save the Children, the exquisite 19th century Methodist church, the Jolly Sailors public house, the proper old-fashioned butcher, and in summer the boat trips to Havergate Island. I mourn the conversion of the shabby, magnificent old Crown and Castle Hotel into just another gastropub, and I wish English Heritage hadn't captured the castle. 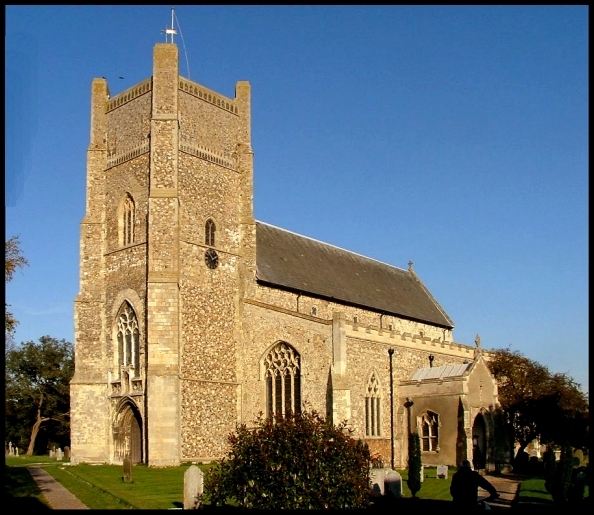 But this is still a place with a sense of its local identity, a Suffolk town for Suffolk people. If the King ask "who are you then?" We humbly answer "Orford Men". "We're Orford Men, and that's enough". A church to explore and to wonder at, a tiny, smoky town to wander, with a magnificent castle and a beautiful harbour and a quayside to crab from. What more could you want? Orford is always a delight.